and the harmonic field generated from the intersection of these four fundamentals, their 16 open-string "partials," and the harmonic series ascending from each of these 16 strings ("partials of partials") serves as the sonic fabric, the "skin" of the piece. The pitch space derived from this tuning contains an abundance of intervals separated by less than 20Hz. Further, due to the scordatura these are idiomatically achievable (as combinations of open strings and harmonics, e.g.) and acoustically stable. In other words, I can write an interval for two of the players in this tuning that sustains a continuous and reliable 14Hz beating (as the interval between two open strings). 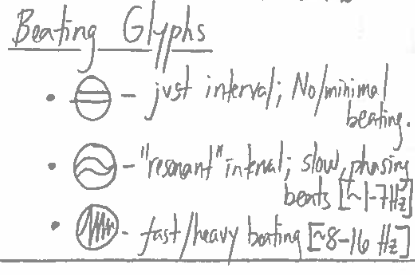 This allows for the deployment of precise beating speeds as musical structures (used as rhythms or to set tempi), and also for a more fluid conception of consonance and dissonance – as a spectrum of speeds and intensities of acoustic beating. While "schisma" does have a precise technical sense in tuning theory, I use it here in a more metaphorical way, as a kind of tectonic fissure between tuning grids. The use of 40 and 60Hz as fundamentals offers access to several acoustic and perceptual "formants" (unarbitrary frequencies of special resonance in a space). The cellist tunes the C-string down to B quarter-flat, sounding 60Hz. Playing a 60Hz pitch in any room with electrical lighting or idling appliances can produce an acoustic reinforcement akin to the "singing in the shower" effect, as 60Hz is the frequency at which voltage travels in the continental U.S.
(see the nerdy "Bibliography" below), and that half of a 40Hz period is the smallest grain-size of neural time, a "quantum of consciousness." Another conceit of the piece is that the self-similarity of the material allows for it to be either extended in time (i.e. the movements follow each other sequentially, as a traditional concert piece) or remain more or less un-extended, in which case all of the material can be presented simultaneously as a "time-object." Within this form, three versions of the piece co-exist (separated by the asterisks). The sequential, linear, concert version of the piece begins with the first Schisma and proceeds through the end of Panel IV. At this point, the piece is functionally complete, and in the concert version must be shocked back to life by a "Schreckensfanfare," a series of noise bursts that compress all of the previous 50 minutes of music into 400 milliseconds. This Beethovinian reboot supplants the sequential presentation of the first four panels with the simultaneous "time-object" of Panel V.
Panel V, one its own, is thus a competing and self-standing version of the piece. In Panel V, the material from the first four panels is collaged into two versions of a 45" ritornello/buffer, repeated in alternation against a gradually enveloping electronic drone composed of layers of time-stretched recordings of Panels I-IV, live processing of the quartet with an "infinite reverb" patch, and live improvisation by the electronics performers with up to 16 channels of granulated recordings of the piece. In the album version, the first Schisma is preceded by a 1-minute hyper-compressed "pill" version of the piece, a seed in which it is possible to hear the entirety of the material that will unfold over the course of the subsequent hour. This, again, represents a functional and self-contained "version" of the piece that challenges the full concert-version for primacy (... kind of, anyway). The theoretical underpinning for this piece was informed by a long period of research. While my pursuit of this "research" was more poetic, intuitive, and cherry-pick-y than rigorously scientific (and e.g. often done with bottle or joint in hand...), I imagine that many of the articles/ideas/ways of thinking that I came across in the course of it could be interesting for similarly minded musicians. Amacher, M. “Psychoacoustic Phenomena in Musical Composition: Some Features of a ‘Perceptual Geography’,” in Arcana III, New York, NY: Hips Road, 2008. Castanet, P.A. (2000). Gérard Grisey and the Foliation of Time. Contemporary Music Review, Vol. 19, Part 3, p.29-40. Castro-Alamancos, M. (2013). The motor cortex: a network tuned to 7-14 Hz. Frontiers in Neural Circuits, 7(21). Clarke, E. (1987). Levels of structure in the organization of musical time. Contemporary Music Review, Vol. 2, p.211-238. Eihei Dogen (trans. Rev. Hubert Nearman, O.B.C.). Shobogenzo. Shasta Abbey Press, Mount Shasta, CA. Droit-Volet, S. and Meck, W. (2007). How emotions colour our perception of time. TRENDS in Cognitive Sciences, Vol. 11 No. 12. Farb N., Segal Z., Mayberg H., Bean J., McKeon D., Fatima Z., Anderson A. (2007). Attending to the present: mindfulness meditation reveals distinct neural modes of self-reference. SCAN 2, 313-322. Grisey, G. (1987). Tempus ex Machina: A composer's reflections of musical time. Contemporary Music Review, Vol. 2, p. 239-275. Harrison, Bryn (2007). Cyclical Structures and the Organisation of Time. University of Huddersfield. Katagiri, D. Each Moment is the Universe. Boston: Shambala, 2008. D. T. Kemp, “Stimulated acoustic emissions from within the human auditory system,” J. Acoust. Soc. Am., vol. 64, no. 5, pp. 1386–1391, Nov. 1978. G. Kendall, C. Haworth, and R. F. Cadiz, “Sound Synthesis with Auditory Distortion Products,” Computer Music Journal, vol. 38, no. 4, Winter 2014. Kirk, J. (2010). Otoacoustic Emissions as a Compositional Tool. ICMC 2010, p.316-318. Llinás R. and Ribary U. (1993). Coherent 40-Hz oscillation characterizes dream state in humans. Proc. Natl. Acad. Sci. USA, Vol. 90, pp. 2078-2081. Llinás R. and Ribary U. (1994). Human oscillatory brain activity near 40 Hz coexists with cognitive temporal binding. Proc. Natl. Acad. Sci. USA, Vol. 91, pp. 11748-11751. McAdams, S. (1989). Psychological constraints on form-bearing dimensions in music. Contemporary Music Review, Vol. 4, p. 181-198. Oster G. (1973). Auditory Beats in the Brain. Scientific American, 1973, 229(4), 94-103. Salt, A. and Kaltenbach, J. (2011). Infrasound from Wind Turbines Could Affect Humans. Bulletin of Science, Technology, and Society, 31(4) p.296-302. 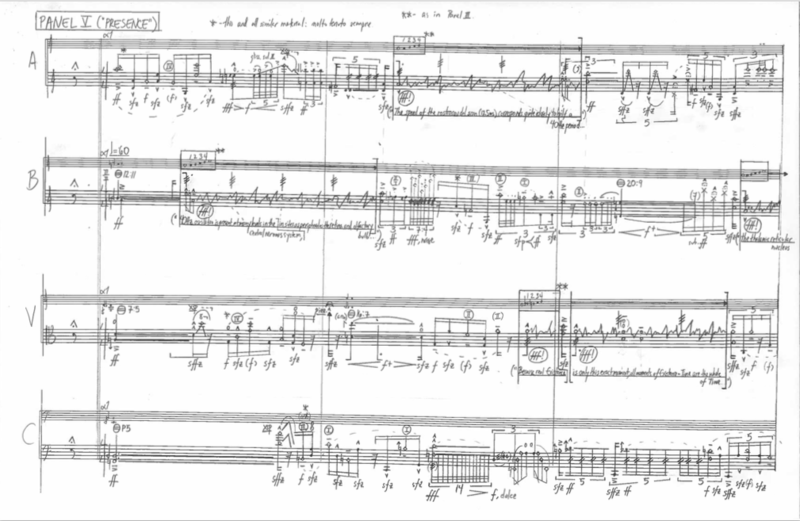 Stockhausen, K. (1955). Structure and Experiential Time. Die Reihe, Vol. 2, p. 64-74. Wittmann M., van Wassenhove V., Craig A.D., Paulus M. (2010). The neural substrates of subjective time dilation. Frontiers in Human Neuroscience, Vol. 4. Wittmann M. (2009). The inner experience of time. Phil. Trans. R. Soc. B, 364, 1955-1967. 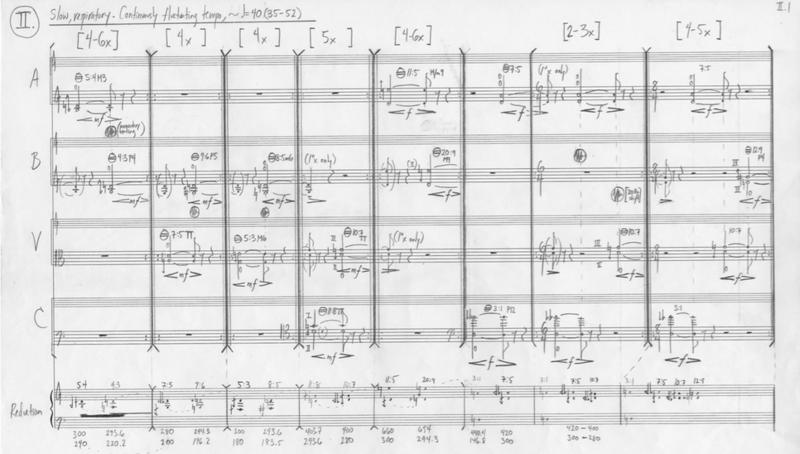 Aldo Clementi (Madrigale), James Fei (Horizontal / Vertical), Morton Feldman, Gérard Grisey, Bryn Harrison (Surface Forms Repeating), Klaus Lang, Alvin Lucier, Giorgio Netti, Chris Otto (Violin Octet), Eliane Radigue, Wolfgang von Schweinitz, Karlheinz Stockhausen, and LaMonte Young. ... and film/TV by David Lynch and Eric Andre (esp. The Eric Andre Show Season Two Finale, which was the key that opened up a way to realize Panel V...).